This week’s EBSQ Blogger of the Week creates magic with polymer clay. It’s the magic of a beast from a fantasy novel and it’s the magic of Mother Nature all around us. Who is this mage? It’s Mandarin Moon, of course! My name is Chris Kapono and I am from Creve Coeur Missouri. I am a self taught artist and I have been drawing and painting since I was very young. My second passion is nature and the outdoors and this greatly influences every thing I create. A couple of years ago I discovered polymer clay and I fell in love with it’s possibilities. I was amazed at the incredible things that others were making with this clay and decided to give it a try. My first few creations ranged from comical to complete disaster but I slowly I began to learn and develop a style of my own. I rarely pick up a pencil or brush anymore! I have two children, Eric and Hannah, three aquariums and a cat named Simi. Simi is especially fond of my cabochons and I have to hide them or they start to disappear one by one. LOL! A fellow artist on Etsy recommended that I start a blog. I was totally green to all of this (and that was only two years ago ha ha!). I must admit that I don’t blog like I should. I work full time and when I come home I can’t wait to begin working on the ideas that bubbled up during the day. I answer a few emails and head for the art table and don’t look up again until bedtime. Being the shameful blogger that I am, I hesitate to offer tips LOL! But I can tell you what I enjoy when I am cruising through blogs. I really enjoy blogs full of beautiful photos of the artist’s work and hear a bit of the process they went through to create it. I love to hear what it is that inspired the piece too. Yes, I always have to have music when I am working on my art! I found Pandora Radio online and I have discovered so much more music this way! I have very eclectic musical tastes that range from classic rock to indie, new age, alternative and even electronic. Artists such as Beck, Cake, CSNY, Dave Matthews, Moby, RHCP, Pearl Jam, Eels and Enya. How’s that for eclectic?! LOL! Oh gosh…who knows! Sometimes I don’t even know what is going to happen when I sit down and grab up some clay. 🙂 Actually, I plan to learn to make my own books using coptic stitch binding soon. I’ll use a higher quality art paper or handmade papers inside and create my own custom covers for them. I also plan to learn to wire wrap jewelry and will wire wrap my own polymer clay pieces and some of the beautiful jasper, amethyst and agate cabs that I have begun to import. At least that’s the plan….it doesn’t look easy so it all depends on whether I am able! Thank you Chris for being an EBSQ Blogger of the Week! 1. 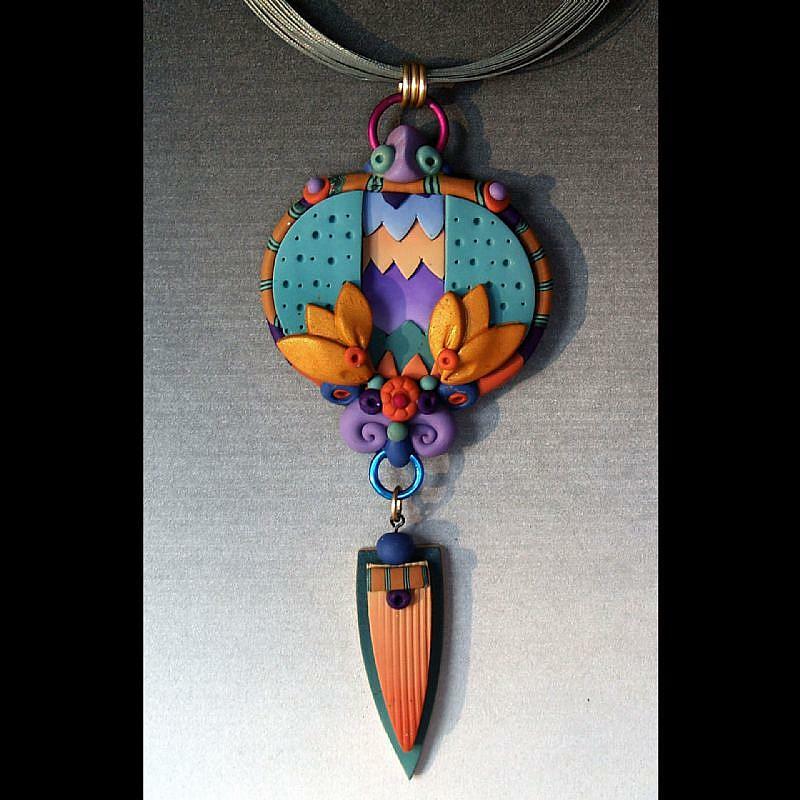 A Group of New Pieces – Polymer clay extraordinaire, Lauren Abrams Cole, shares her new, stunning creations with the world. Aren’t they beautiful!? 2. Pencil Sharpeners for Pastel Pencils – Artist Kari Tirrell offers an informative post on the pro’s and con’s of different, name brand sharpeners. 3. Mother’s Day Giveaway -EBSQ artist, Kimberly Anne Bailey, is having a giveaway for a custom pet portrait. You have till April 22nd to sign up! 4. Spring Sale – Sara Burrier is offering a wonderful deal on her prints if you sign up for her mailing list. Lovers of fantasy and whimsy shouldn’t miss this great deal! 5. Studio Tour – Vicki Miller is having a studio tour on April 14. Check her blog for details. This weeks EBSQ blogger of the week is a well of creativity. She takes her love of color and shapes then applies it to painting, jewelry, clay, mosaics, you name it! Her whimsical designs are an inspiration to all. My name is Maria Greene and I live in the Tampa Bay area of Florida. Art has always run like a red thread through my life, during my years as a full-time writer, and now, a home decor shop owner. Art influences all the areas of my life, my sense of vision of the world around me, my gratitude for being alive, and my ability to express myself through various art forms. Art adds appreciation of shapes and color, especially in Nature, one of my favorite places to be! Heart and Soul, mixed media 12 x12"
I was reading a lot of art blogs and decided to start one myself a couple of years ago. At first I thought to write it through the viewpoint of my cat, but he’s too flippant! I get a lot of inspiration from other blogs, and I walk around with my camera for good pictures to share. Pictures sometimes inspire posts that I might not have thought of before. Polymer Clay Mosaic Tile Mirror, 9.5 x11.5"
Write about your passion! If you don’t know what that is, blog to excavate that from your inner self. Many people can relate to that search, and feel inspired from reading about it. How-to’s about the process of your work are good to blog about, or any kind of tip pertaining to your area of expertise. Don’t be afraid of the personal touch; that’s what will bring in your readers. Blogging will bring you a lot of new wonderful friends all over the world! Sands of Time, mixed media 14x18"
I like Blues artists a lot, but to be honest, I don’t listen to music that often when I work on my art. I find that it distracts me. My passions are too many count. One day I’m painting, the next, collaging. Then I move on to jewelry design and torch-fired enamel beads. I also make unique polymer clay mosaic tiles that I use in a variety of projects. My next finished art piece will be (I hope) a collage-mermaid-painting-mosaic tile adventure, an 18×24” wall art project. I’m about half way there! Thank you Maria for the an EBSQ Blogger of the Week!